Digg has been sold for a reported $500,000 (around £324,000) – and no, we haven't missed a zero. You'd be forgiven for thinking we had though, given that the news rating site was valued at $175 million at its peak. That's a $174.5 million drop in value, kids. As well as the cash lump sum, some equity has changed hands and snapping up the bargain is Betaworks, a New York-based development company that also owns link-shortening service bitly. The company says it is "turning Digg back into a start-up" by running it on a "low budget, small team, fast cycles" basis. Betaworks also plans to tie new Digg in with its news briefing service, News.me. "We have spent the last 18 months building News.me as a mobile-first social news experience," it explains on its site. "The News.me team will take Digg back to its essence: the best place to find, read and share the stories the internet is talking about. Right now." 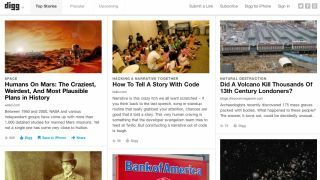 Back in the mists of time (that's internet speak for 2009), Digg was a major influence on the web, driving swathes of readers to any story making the front page of the site. But in the past few years, its influence and traffic has waned while its competition (the likes of Reddit and even Twitter) have grown vastly – although some reports suggest that Digg still sees as many as 16 million unique visitors a month. If all this sounds a bit familiar, then perhaps it's because there are so many parallels between Digg and MySpace. MySpace was bought by News Corp in 2005 for $580 million (£360m) before Facebook took off and all but obliterated the site. In 2011, Murdoch and co cut their losses and sold the network for a fraction of what they paid ($35 million/£22 million).